This is part of an an ongoing series of reviews covering popularly priced bolt-action rifles generally, and .270 Winchester bolt action rifles specifically. For walnut-stocked rifle, the new Mossberg Patriot (#27882) has a very appealing MSRP of about $500 and a street price of around $400. Out of the box, this 22 inch Mossberg Patriot .270 weighs 6 lbs, 14 oz., including the pre-installed alloy Weaver style bases and the detachable box magazine installed. The walnut stock has a nicely ground vented recoil pad and a Monte-Carlo cheek piece. The barrel is cosmetically fluted near the muzzle, the bolt is spirally fluted, and the stock itself has stippled checkering which looks good and is quite functional. The Mossberg trigger is reminiscent of the well-known Savage Accu-Trigger, adjustable from 2 – 7 lbs. Mossberg calls it their LBA trigger. My example breaks at a crisp 2-3/4 lbs. just as supplied. The Mossberg Patriot has a two position safety that does not lock the bolt closed when engaged, a feature that I would have preferred. The barrel finish is matte, but not nearly as rough as some other attempts. The barrel has a recessed target crown. For $400, it is about the best-looking bolt-action rifle you can buy. It really is tastefully done and very well-done in general. I topped off this Patriot with a Sightron Big Sky SII 3-9 x 42 rifle-scope with Warne Maxima Quick Release steel rings. The whole assembled package weighs 8 lbs., 5 oz. unloaded. And, it shoots! The previously reviewed Mossberg Patriot .270 Winchester with a plastic Kryptek stock was essentially an MOA rifle right out of the box and this walnut-stocked version is noticeably better than that. 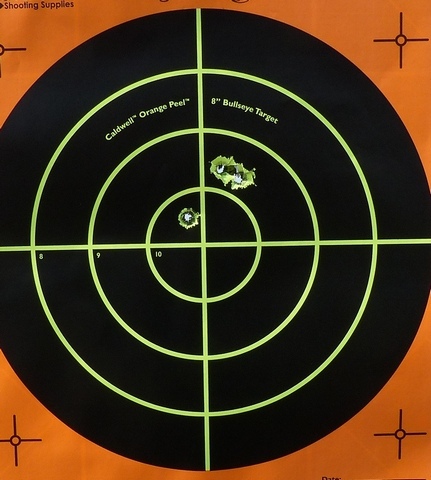 Using hunting ammo, Hornady's 130 grain GMX “Full Boar” #80527 cartridges, it was effortless to get on the paper and shoot inside an inch at 100 yards, despite a very gusty direct crosswind. If your budget says $400 or so for a center-fire hunting rifle, this is the best on the market by no small margin and is Mossberg's best rifle yet as far as I'm concerned. It looks good, the detachable box magazine is extremely easy to load, it doesn't rattle, and the trigger is light and crisp. The feeding, extraction, and ejection are all smooth and hassle free. There isn't much left to say except congratulations to Mossberg for an industry-leading, best-in-class product that anyone would be proud to own and use.